On a lazy Sunday morning I decided I would try doing this contour/highlight technique and test how well it works on me. This is my first time, so join me on this journey below. There are amazing videos on how to do this on youtube, I’d suggest you search there for an exact technique, this post will simply be whether or not the look is easy enough to pull off by someone doing it for the first time. I primed and added foundation using my fingers all over my face to start using Yves Rocher’s Pure Light in Rose 200 Light. For Highlight I used Covergirl’s Ready Set Gorgeous in Light adding it where the light would naturally hit my face so under my eyes in an inverted triangle shape, bridge of my nose, either side of my nose, my forehead, and also a bit on my cheeks. Next I added the contour shade, I mixed a bit of Yves Rocher’s Sunkissed Effect Fluid Foundation with Yves Rocher’s Pure Light Foundation in Rose 200 Medium. It’s suggested you use a colour that is about 3 shades darker than your skin tone (looking at the photos now, I don’t think I needed to add bronzer, the foundation on it’s own was enough). I added it just below my cheeck bone, around my chin, my hairline, and around the highlight line on bridge of my nose. Below is my masterpiece, haha! I then used a blending sponge to blend first the highlight then the contour, it started to come together at this point. 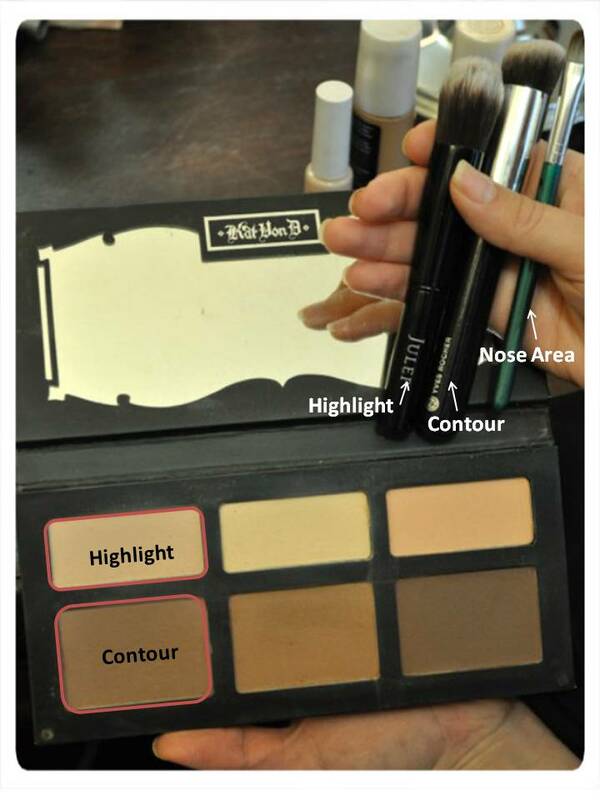 To set my makeup I used Kat Von Dee’s Shadow and Light Contour kit. I used one brush for highlight, one for contour, and a small brush for around my nose and eyes. I started by applying the highlight and then the contour. At first I was not sure how this would look on my face because I am fair so I didn’t want to look like I had put on the wrong shade of makeup. For a first try, its not perfect, but it’s not something I couldn’t perfect as I practiced, using more or less of the colours to parts of my face that need it. My lovely sister took photos using her DSLR and I feel like the makeup looked pretty nice and natural on camera. Would I actually do this look should I go out?? Probably, but only for a special occassion because it is quite a lot of makeup for me to wear everyday. How do you feel about hightlighting and contouring? Any tips on how I can improve for next time? I think it turned out great 😀 Your face looks perfectly defined in those photos! 🙂 XXXXX looks great xo !!!! Please can you check out my blog? It’s about fashion and beauty. I’m sure that you’ll like it! Sorry but I don’t know why it doesn’t worked to you. It worked! I don’t know what went wrong.